This core text covers everything on building a successful practice—from disclosure to marketing to taxation—with student features such as checklists, contracts, CAR® and other sample forms, and quizzes and exams that closely follow the state exam. It has been updated to reflect changes to the TILA-RESPA rule, including the new Loan Estimate form. A complete set of instructor Resources includes discussion topics, student exercises, PowerPoints for each of the 15 chapters, and a midterm exam and two final exams with answer keys. 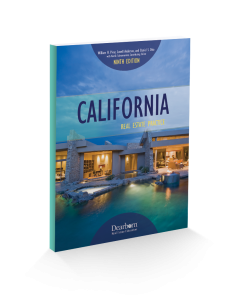 Product Name: California Real Estate Practice 8th Edition **almost out of stock!